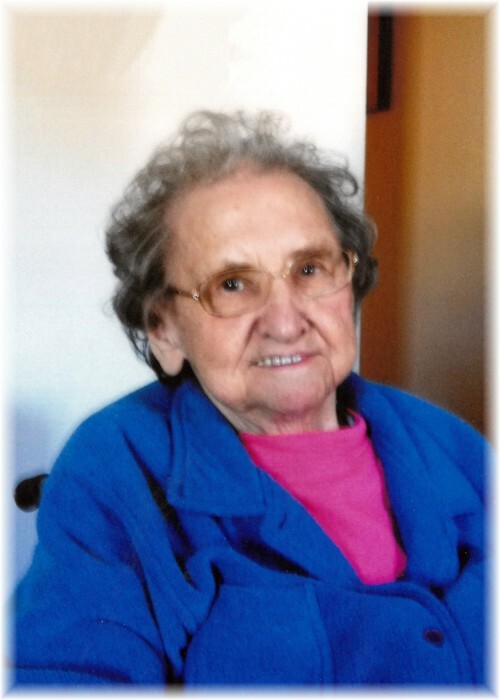 It is with deep sadness that the family announces the passing of our beloved mother, grandma/baba, and great grandma/baba on Thursday, January 24, 2019 at the Centennial Special Care Home in Esterhazy, Sask. Alexandra (Yaworsky) Boyko was born in Garland, Manitoba on September 10, 1925 to John and Petrunella (Pearl) Yaworsky. She attended Garland and Stenson schools in Carberry, MB. After leaving school, she worked at Dauphin Steam Laundry. Then Alice went to Toronto and worked at General Engineering Co in Scarborough during the last year of the war, 1944-45. Alice married John Boyko on October 22, 1946. After raising a family of 6, Alice worked at the Highland Motel, Home Care, and St. Paul’s Home before retiring in 1989. She was a member of the Ukrainian Catholic Church in Dauphin, World Apostolate of Fatima, and the Apostleship of Prayer. Alice was predeceased by her husband John in October 2009, parents John and Pearl Yaworsky, sister Anne and husband Steve Kalinowich, sister Francis and husband Mike Moshenko, sister Emily(Emilia) and husband Tony Boyko, sister Mary and husband Norris Olmstead, siblings Rose, Emilia and Paul as infants, brother Billy as a young child, and brothers Nicolas and wife Mary and Maurice and wife Mary. Alice is survived by her children Bernice (Mel) Kinsley, Linda Brayshaw, Gail (Archie) Marcynuk, Lorrayne (Ray) Smith, Wayne (Bev) Boyko, David Boyko (Catherine Cox). She is also survived by 12 grandchildren, Grant (Sandra) Kinsley, Kevin (Novie) Kinsley, Todd (Lynn) Brayshaw, Sherri (Jason) Spencer, Craig (Brandice) Marcynuk. Jamie (Nicole) Smith, Michelle Duerr, Cory (Renee) Smith, Mathew Boyko, Brenden Boyko, Jody Boyko, Shannon Boyko (Joel Peddie), 14 great grandchildren, Simon and Oliver Spencer, Kaden and Quinn Brayshaw, Preslee, Gracyn and Lowynn, Zachary, Wesley Marissa and Lydia Smith, and Annabella, Aiden and Nevaeh Smith in addition to numerous nieces and nephews. Religion formed a very important part of her life as well as many hobbies which included knitting, crocheting, embroidery, quilt making, TV, gardening and reading. She made a lot of clothes for the girls as they grew. Anything to keep her hands busy. There were jars of canning and bags of frozen food. It was hard to leave her place without her insisting we take something she had made. She worked on history scrapbooks for all of us before scrapbooking was popular and she and John recycled long before it had a name. Alice also greatly enjoyed her family when they visited or phoned. You walked in the door and she asked “Are you Hungry?” She was so proud of her children and grandchildren and any or all accomplishments. She also did extensive travelling which she enjoyed greatly. Whether it was motoring down to the east and west coast of Canada and US with John or her trips to Dubai, Abu Dhabi, Ukraine, Lourdes & Fatima, Italy and the Holy Land. One time she rode the train to Churchill (which was not a short trip) to have coffee with her niece, Joan. Alice and Joan enjoyed a special bond and she loved to see new things. When the time came, she relocated to Esterhazy, Saskatchewan where she lived with her daughter Lorrayne, until an opening was available in the Centennial Special Care Home. In her new home Alice enjoyed a peaceful and safe life during her last years. The staff tells fond stories of Alice during that time. The family can not offer enough thanks for the comfort and care mom Alice received while there. Should family and friends so desire donations may be made to the Ukrainian Catholic Church of the Resurrection. Prayers were offered on Thursday, January 31, 2019 at 6:30 pm from Sneath-Strilchuk Family Care Centre in Dauphin, MB. Funeral Liturgy was held on Friday, February 1, 2019 at 10:00 am from Ukrainian Catholic Church of the Resurrection in Dauphin, MB with Very Rev Father Oleg Bodnarski officiating. Interment followed in Riverside Cemetery in Dauphin, MB. Active Pallbearers were Jamie Smith, Cory Smith, Zachary Smith, Wesley Smith, Michelle Duerr, Bill Kalinowich. Honorary pallbearers are anyone who touched Alice’s life. Nicole Smith read the Epistle. Lydia Smith served as cross bearer and Michelle Duerr read the eulogy. Many thanks to all. A big thank you to Joan Kinaschuk for opening her house for lunch after the prayers. Another thank you to the ladies who prepared and served lunch after the funeral.